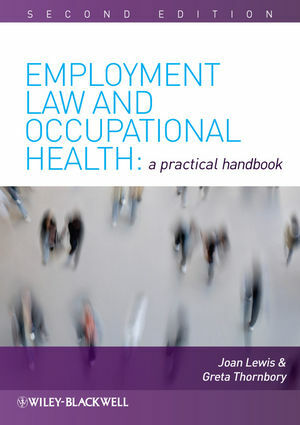 'Employment Law and Occupational Health: A Practical Handbook' provides an essential guide to best practice for all occupational health practitioners. This readable guide to the law will help to ensure both business success and respect for individual employment rights. The cost of sickness absence can present major costs and business management problems. Safeguarding health is therefore vital to both individuals and employers. 'Employment Law and Occupational Health' explores key issues in occupational health practice from pre-employment, through health surveillance and occupational health services, to termination of employment. Topics explored include ethical and confidentiality issues, discrimination, data protection, working abroad, pregnancy and maternity leave, workplace policies, drugs and alcohol testing, stress, counselling, health surveillance and professional conduct rules. This second edition has been fully revised and updated to include a number of significant changes to employment law as well as new case law decisions that have occurred since the 1st Edition was published. Essential new material has also been included around age discrimination, disability discrimination, work related stress, corporate manslaughter and work-place bullying. An accessible, practical guide to applying health law in everyday practice. For occupational health nurses and other occupational health practitioners. Addresses key employment issues from pre-employment to termination of employment. Includes case studies, procedural checklists, and template letters and forms. Joan Lewis is a consultant on employment law and human resources management. Greta Thornbory is a consultant on occupational health and education. 1. Recruitment and Pre-employment Health Assessment. Methods of pre-employment health assessment. The Public Interest Disclosure Act. 3. Health and Safety at Work. The Employers’ Liability (Compulsory Insurance) Act. The Health and Safety at Work Act. Prosecution for health and safety offences. The effects of work on health. Occupational health and health surveillance. Health surveillance for physical hazards. Business travel and health surveillance. Discrimination and unfair employment practices. Elements of causation of stress-related illness. The role and function of occupational health services. Moral and ethical aspects of occupational health. The development of occupational health related law. Functions of an occupational health service. Types of occupational health services. What do occupational health services offer? 5. Managing Absence and Rehabilitation. Sickness during disciplinary and other internal proceedings. Sick pay and medical evidence. Principles of rehabilitation and case management. Medical and occupational health advice. Appendix Occupational Health Service Confi dentiality Policy. Appendix COSHH Health Surveillance Registration Form. Appendix Letter to Employee Requesting Attendance at Occupational Health. Appendix Letter from Occupational Health to GP or Specialist. Appendix Employee Consent to Disclosure. Appendix Occupational Health Report Form to Management. Appendix Medical Report Consent Form. Appendix Risk Assessment Example Template: for Guidance on Evaluating Level of Risk. Appendix Sample Protocol Outline: Data Protection. * An accessible, practical guide to applying health law in everyday practice. * For occupational health nurses and other occupational health practitioners. * Addresses key employment issues from pre-employment to termination of employment. * Includes case studies, procedural checklists, and template letters and forms.